Joining in the Guthrie Family performance this year is Cathy Guthrie! Cathy is one of Arlo’s daughters and a self-described “musical holdout” among her family members. 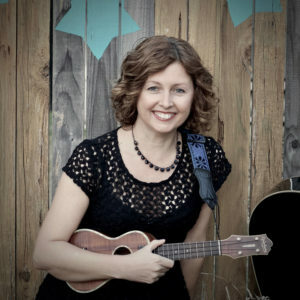 Acknowledging the musical momentum perpetrated by her family line, however, she eventually joined forces with her friend Amy Nelson (Willie’s daughter) to form a guitar-and-ukulele-driven folk duo called Folk Uke. Together, she and Nelson deliver so-wrong-it’s-right songs ​about difficult things like heartache, loneliness, and abuse. Not for the easily offended, but wickedly entertaining for those who aren’t.